I used to love Godiva around 4 years ago, but ever since my discovery of unique boutiques and special mom-and-pop shops in cities, Godiva began tasting generic to me. 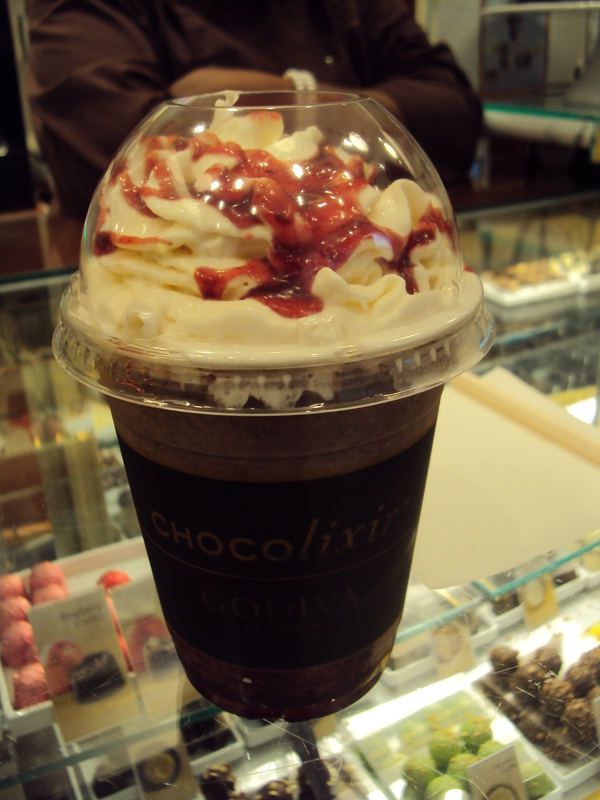 However, I never got sick of their Chocolixirs, the best cold drinks in the world!! Smoothly blended, rich, refreshingly cool, frappe-like drinking chocolate is my best definition of it. One usually finds bits of chocolate through the drinking process and the drink is topped with generous whipped cream. Today I got the Dark Chocolate Raspberry Chocolixir, one of the newer additions to the menu, and my, was it a heavenly trip of decadence…sweet, blissful decadence. Raspberry naturally complements chocolate well, and the extra raspberry syrup and raspberry bits mixed with the chocolate bits really hit the spot for my chocolate craving. Godiva’s also doing a good job with its new Rewards Member option. A month ago, I signed up for the card at the retail store, which is free of charge. Basically this means I am entitled to a free piece of chocolate every month, and I have access to Rewards Members promotions. This is both a pretty good deal for me and a pretty good marketing strategy for Godiva, as the promotions tempt chocoholics like me to purchase more! Another sign of Godiva’s comeback is its new line of Godiva Gems wrapped in enticingly colorful wrappings (my suitemate Pri is in love with these), and new line of ice cream truffles, which I ordered online with my free Rewards Member promotion. There are many different types of ice cream truffles, which I will be ranting and reviewing about in my next post… so stay tuned! Grade: I seriously think Chocolixirs deserve an A. They’re amazing! *The retail store I went to was at King of Prussia Mall, but you can probably find a store near you easily since it’s a chain. 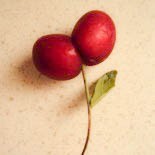 I’m going to have to try one of these, it looks delicious. I’m convinced that internal heat/cool thing is a lie that Asian parents make up to trick their kids into eating healthier. Or maybe not, my body temperature is absurdly high and I have cheeseburgers and fried things all the time. Didn’t realize Godiva served drinks haha. Really? I think there’s some truth to it, although I’m not sure if internal heat/cool thing is related to body temperature as much as I think. But you know how some foods like chocolate tends to make people break out? I think there’s definitely some correlation there. And yes, you should try it sometime! It’s delicious! This entry was posted on May 23, 2010 by bubblepeachtea in PA: King of Prussia and tagged beverage, chocolate, chocolixir, dessert, Godiva.